Humans enjoy all the festivities that come with celebrating the holidays. 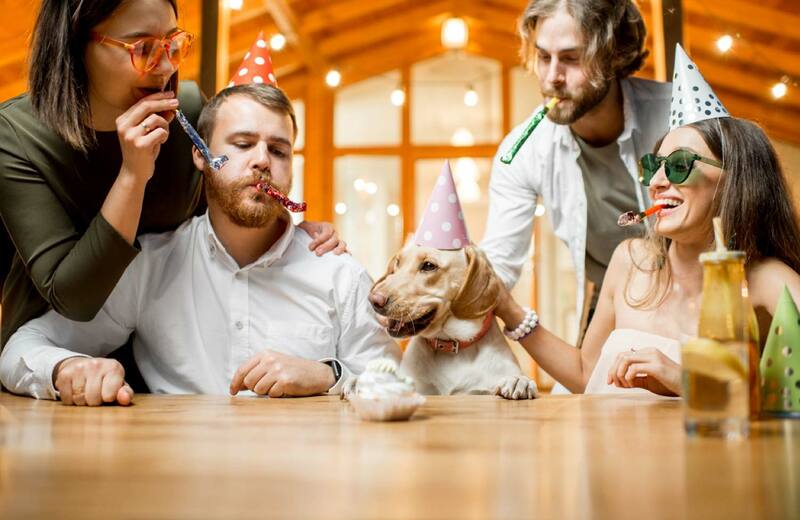 Unfortunately for our pets, these celebrations usually result in increased numbers of guests, dangerous decorations, loud noises, and a general unfamiliar commotion. All of these changes can result in a lost, frightened or even sick pet. Here are some tips on how to enjoy a festive holiday while ensuring your pet enjoys the celebration almost as much as you do. Desensitize your dog or cat. One of the best things that you can do is to make your pets accustomed to the natural noises, smells, and sites of everyday life. Cats should be desensitized at a young age or when you first bring a new adult home. Cats tend to display a skittish nature, but this can be decreased by offering them gradual exposure to acclimate them to new experiences without invoking fear. It is important to consider the inherent skittishness of your cat – the stimulus gradient needs to be progressive, but slow. A good way to start to acclimate a cat to new sounds is by using toys that have bells and whistles, or toys that generally make a ruckus. You want them to get comfortable with these noises. Gradually increase the stimuli until your cat is comfortable with the sound of loud fireworks or conversations coming from your electronics. While these practice sessions are occurring, you need to reinforce positive behavior by giving favorite treats. The progression of intensity is too fast if your cat runs away or hides. Cats are surprisingly adaptable, and many cats will overcome their fear in a relatively short amount of time. For dogs, gradually introduce them to unfamiliar faces and places. Taking your dog on trips to the park allowing them to experience other humans and dogs will allow them to grow accustomed to external stimuli. To avoid becoming noise phobic, or if your dog already shows signs of fear when hearing fireworks or thunder, use toys and treats to distract and make happy experiences with a sound clip on your phone, tv or computer and gradually increase the volume until your dog is happily playing or taking treats even at a real-life volume. If you have a new puppy, take note that they tend to be more impressionable and receptive to the outside world during this stage, making it much easier to desensitize at a young age. A naturally confident dog will be able to endure fearful experiences much better than a reactive, shy dog. 1. Careful Consideration of Decorations. When decorating a house, make sure that decorations are out of reach from your pets. Lighted candles may be knocked over and wires can be a choking hazard or cause a potentially lethal electric shock – use reinforced wire casing to protect it from your curious dog or place them behind heavy furniture. Consider taking down your Christmas decorations immediately after the holiday. Avoid decorations that will attract the eye of your cat and dog. Stringy decorations are especially popular with cats, as they sometimes confuse it for a toy. Small statues and figurines are the perfect chew toy for your dog. 2. Crate your pets. Sometimes the extra excitement is too much for your pet, and you may not have the time to desensitize your cat or dog appropriately. The best thing you can offer your pet is to give them a safe space to settle down during New Year’s Eve. It may be necessary to place your skittish cat or dog in a quiet section of the home, using baby gates to secure a room for your dog or a large crate or unused bathroom to place your cat until the end of the night. 3. Update your pets ID tags. During the holidays, there will be more foot traffic in and out of your home, creating more opportunities for your cat or dog to escape out of an open door. Make sure that their tags are up-to-date, or better yet, have a veterinarian place a microchip so you can be reunited with your furry family member if their collar falls off or a tag is lost. 4. No alcohol for your pets. Many alcoholic beverages tend to have a strong smell that attracts pets. Even though it may seem funny for your pet dog to lap up a cup of wine, the main ingredients in alcohol are toxic to your pets, especially dogs. Many wines are also made from grapes, which can be potentially toxic to dogs. Even if the alcohol consumed isn’t toxic, it can cause very dangerous side effects and treatment require lengthy and expensive hospital stays for your pet.